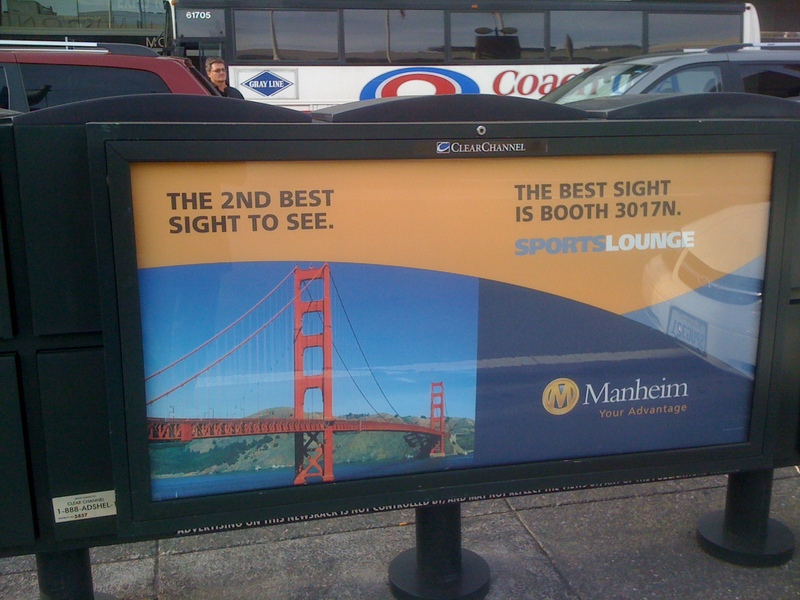 I recently returned from the National Automobile Dealers Association (NADA) trade show in San Francisco for our client Manheim. We repurposed last year’s “sports lounge” booth, enhancing a few key elements. Why would we want to use the same sports lounge concept from last year? Well, it worked. How do we know it worked? We looked at the results. We didn’t just look at anecdotal comments from industry leaders such as Kathy Jackson of Automotive News, who stated in her blog, “They really had it going on at the Manheim booth – sports bar with lots of flat screen TVs and free beer, wine, soft drinks and nuts. You would have thought you were on the set of ‘Cheers.’ The bar was packed.” We also looked at last year’s results, such as 800 unique attendees engaged at the booth for an average of 28 minutes per person. So going into planning for this year’s trade show, the consensus was to go with what worked last year and aim to make it even better. The primary goals were to increase the number of attendee engagements as well as time spent with the attendees. First, we increased the size of the booth footprint, making the sports lounge 10 feet deeper. Since the sports lounge was packed last year, we figured attendees may appreciate more seating and more elbow room. And, oh yeah, we may be able to engage with even more attendees. Second, we promoted the sports lounge with news racks near the trade show and pre-show e-blasts to dealers, promoting an NFL replica football giveaway. Third, we secured and branded a nearby sports bar with 31 interior and exterior window banners, two continuously looped, closed-circuit television spots, napkins and cups. We invited attendees to join Manheim and watch the “Big Game” between the Green Bay Packers and Pittsburgh Steelers on February 6th after the trade show. There, we gave away more footballs, iPod touches and iPads. An increase in unique engagements over last year, from 800 to 1,150. An increase in average time spent in-booth with attendees, from 28 minutes to 32 minutes. 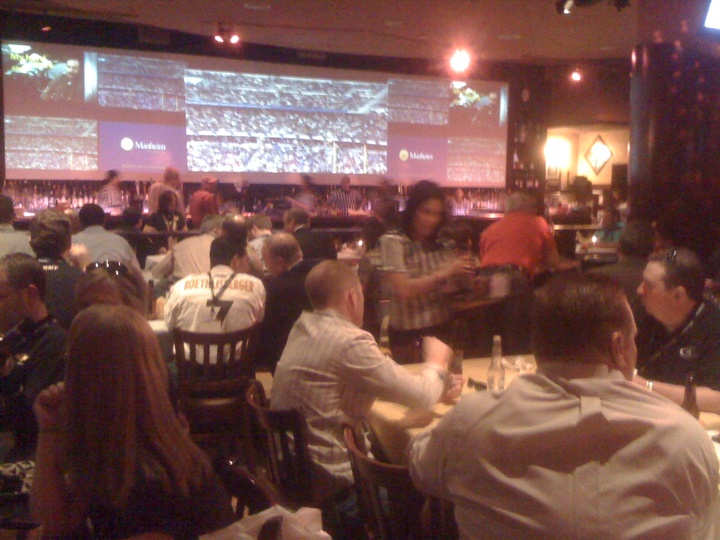 Engagement with more than 350 attendees for an average of THREE-PLUS hours at the off-site sports bar. So what does it all mean? First, by establishing measurement criteria up front and looking at results, you can evaluate program-to-program performance objectively. Second, even if previous results were good, they can always be better. Third, you may not need to reinvent the wheel to drive results. And finally, people like free beer and sports. It’s been said that U.S. employers lose an estimated $1.8 billion in productivity during March Madness. What is it about office pools that not only drives employees to spend so much time planning, watching, and discussing, but also drives employers to look the other way? Whether it’s “March Madness,” college football bowl pools, or even the weekly football pick ’em, office pools are a compelling form of entertainment that provides an office common ground in a friendly, competitive environment. The days of copying a sheet of paper and turning it in to the office pool manager have succumbed to the digital age. One only has to type ”office pool” into Google to see page upon page of office pool variations with free and pay-to-play websites and software. Many of these websites and software provide tips and post-pick analytics in real time, so that everyone can see the results and how they rank against the competition. It’s a time when the office sports geeks and sports agnostics are on the same wavelength, as employees become more engaged with one another. Water-cooler talk turns from gossip to last night’s upset and today’s Cinderella. Maybe employers look the other way because it’s an easy way to improve employee morale, or maybe it’s just because they’re in on the action, too. Regardless, it’s easy to see why something as compelling, measurable, and engaging as office pools continue in the work environment. With that, feel free to join us in some compelling, measurable engagement by participating in the 2010 Kilgannon College Bowl Pool. It’s free to play, and you could win a gift card. So have you seen the movie yet? I’m referring to The Social Network, or, as my parents call it, “that Facebook movie.” If you haven’t seen it, I highly advise you to stop reading (or continue reading on your mobile device) and get to the theater ASAP. Why recommend this movie? First of all, it was fantastic. Secondly, the results have been nothing short of spectacular. And that’s the world we live in, where everything from entertainment to marketing and advertising budgets has become results-oriented. Gone are the days when people were willing to spend their money, personal or business, without setting expectations. How easy is it to go online and check out a movie’s trailer, see what others think of the movie, and then purchase the tickets? From research to transaction in a matter of minutes. So what does the research say about The Social Network?